Suze, featured here with Bob, often talked about feeling like "a string on her boyfriend's guitar." Today’s Jam of the day will be dedicated to the loving memory of Suze Rotolo, the muse of Bob Dylan who died yesterday in NYC at the age of 67. 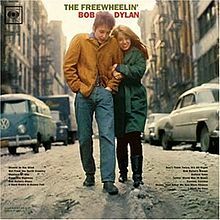 Suze was featured on “The Freewheelin’ Bob Dylan” cover and was interviewed by Martin Scorsese for his Dylan documentary entitled “No Where Home.” The couple dated for three years – from 1961 to 1964. Suze inspired 2 additional love songs including “Don’t Think Twice, It’s Alright.” She was a noted illustrator, artist and writer who penned the autobiography: “A Freewheelin’ Time: A Memoir of Greenwich Village in the 60’s. After Rotolo’s breakup with Dylan in 1964, she met and married Enzo Bartoccioli, a film editor, who she remained with until her death yesterday 2/28/2011. This entry was posted in Uncategorized and tagged Bob Dylan's muse dies at 67, Freewheelin' Bob Dylan, Martin Scorsese, No Where Home documentary, Suze Rotolo, Suze Rotolo book, Suze Rotolo muse. Bookmark the permalink.